They say that it will never happen again, seeing two great martial arts movie icon, Jackie Chan and Jet Li in one movie. I won’t let it pass without seeing this on the big screen because this is the first movie together by Chan and Li. For that reason enough, you should watch it! I’m giving it 4 out of 5 stars. The movie was great. The effects and the martial arts choreography were awesome. I just love the antics on this movie. It will entertain you with either through the magnificent martial arts or with the funny scenes delivered by the actors. So if you’re looking for a good movie this week, I would definitely recommend The Forbidden Kingdom. By the way, the movie is mostly in English a little of Mandarin and if you’re wondering who’s billed first in this movie between Jackie and Jet, their names were shown together on the opening credits, just like this…. In Forbidden Kingdom, American teenager Jason (Michael Angarano), who is obsessed with Hong Kong cinema and kungfu classics, finds an antique Chinese staff in a pawn shop: the legendary stick weapon of the Chinese sage and warrior, the Monkey King (Jet Li). With the lost relic in hand, Jason unexpectedly finds himself transported back to ancient China. There, he meets the drunken kungfu master, Lu Yan (Jackie Chan); an enigmatic and skillful Silent Monk (Jet Li); and a vengeance-bent kungfu beauty, Golden Sparrow (Crystal Liu Yi Fei), who lead him on his quest to return the staff to its rightful owner, the Monkey King – imprisoned in stone by the evil Jade Warlord (Collin Chou) for five hundred years. Along the way, while attempting to outmaneuver scores of Jade Warriors, Cult Killers and the deadly White Hair Demoness, Ni Chang (Li Bing Bing), Jason learns about honor, loyalty and friendship, and the true meaning of kungfu, and thus frees himself. On the way there, I was thinking of my friend Lizzie, who happens to live very close to SM Marilao. Mga 10 kandirit lang siguro. Hihihi. Mega wish ko nga na makita siya coz it’s been a while since I saw her. If my memory serves me right, the last time was when we had her birthday celebration months ago in their resort in Cavite. (Sorry Liz, indi ko pa ma upload yung pics natin, sira na naman yung PC ko e, asa hard drive). Basta! I was so happy to see her and Lana, though I think Lana was a bit shocked ng makita nya ko, not because I lost weight or tinubuan ng kung ano…ginulat ko kasi eh sa SM Hypermarket ba naman na ang dami ng tao. Bwahahaha. My bad! I love to do that! Ayun! Ang payat na ni Lizzie!!!! GosH! Inggit na talaga ang lolah nyo… Haayyyy… I should start my serious dieting…. After seeing Liz, na miss ko din tuloy si Aimz bigla…. aimz’s last blog post..vote for the new 7 wonders of nature! wagi ito promise..indi ka magsisi IT! 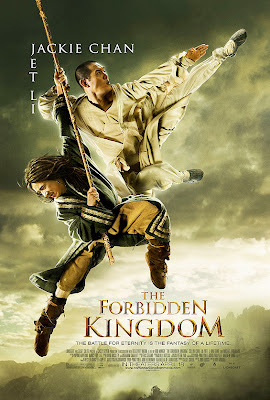 I just saw Forbidden Kingdom with my husband – oh, it was magnificent! I adored the martial arts training scenes especially (the horseback stance one was classic). Barbara Ling’s last blog post..Freakin’ takin’ it ’till it hurts and begging for more – do you have what it takes to make money online? I was kinda worried though at first if it will be a full length Chinese movie and I have to read the subtitle…but luckily it was not. His first movie was entitled “Snake In The Eagles Shadow“, that was his first time he starred as the leading main character. I’ve also watched Drunken Master II and Police Story. They were classics. I also think that the old Jackie Chan films are way better than the new ones that are coming out today. Perhaps because his recent films are slowly becoming americanized. Incredible, great blog format! The span of time are you running a blog regarding? you made blog view easy. The entire glance of your respective web site is wonderful, not to this article!